Hekate – Dark Mistress of the Soul. Both Hekate and Hermes share the role of psychopomp and protector of the crossroads and by-ways of the mental and physical planes. 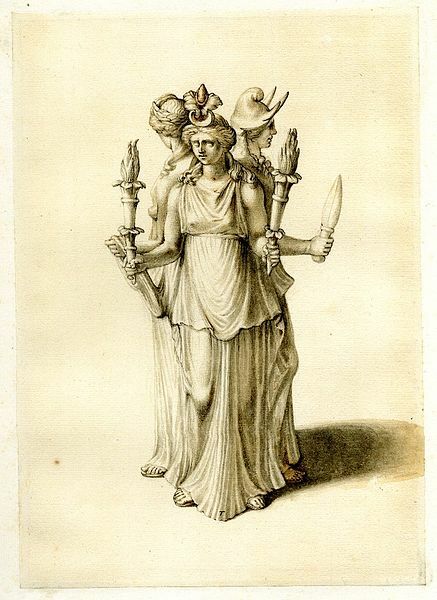 ‘Herm’ posts often stood beside those of ‘Hectarea’, the Triple-Formed Hekate, complete with three heads and six arms. Popular myth presents them as lovers or companions, as healers, patrons of Lunar energy and harbingers of death. Bridging the worlds, they reveal past, present and future simultaneously, bestowing prophetic visions and ancestral communication. From their shadowy twilight world of illusion their gifts of enchantment secure the rapture and bliss of their devotees. Another, less well-known epithet of ‘Hekatos’, meaning – ‘Distant-One’ (the airborne magic that strikes its target), is one that Hekate (as a form of Artemis), shares with Apollo. Legends also tell of her as a phosphorescent angel, shining in the darkness of the underworld, where her hypnotic light of trance-formation is revealed within the decaying mounds of the dead. Here her role merges with that of Persephone and of Demeter, with whom she became associated within alternative Greek mythologies. The shadowy world of dreams is where Demetra George [1992:148] suggests we are cocooned; within the nurturing breast of Hekate, suspended in liminal time, we reach a still-point (magical praxis of non-being). This, our moment of becoming, is where she is true mistress of our fate. Our total submission to her brings the rewards of true gnosis. Hekate guides the true seeker, Hekate blesses the newly born child, and Hekate shields and guides the soul upon it final journey. Remember, this young and beautiful fairy godmother wears a crown of stars. It is noted that devotees of the Chaldean Oracles contrived to promote Hekate as Sorteira (Saviour), an epiphanic celestial deity and cosmological principle of the cosmic soul, not unlike the ‘World Soul’ of the Neo-Platonists. 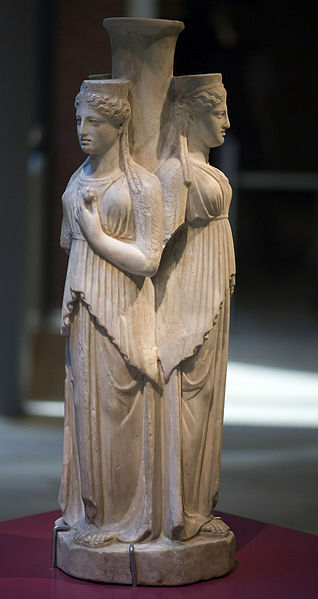 In Asia Minor (c800BCE), Hekate was a member of the Mother, Daughter & Son trinity of Kybele, Hekate and Hermes. Yet by 400CE, her role had devolved into the dark and sinister stalker of graveyards, snatcher of souls, Queen of Witchcraft and Sorcery, Patroness of Circe and Medea [ibid.]. 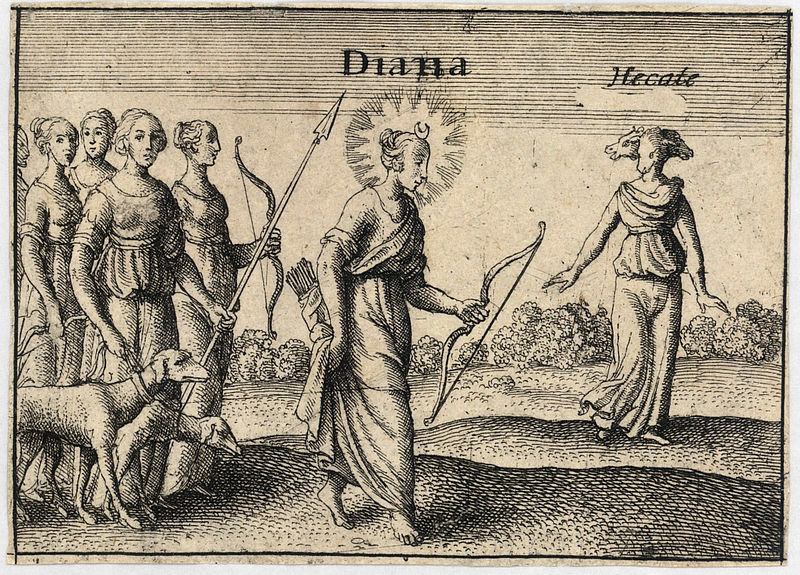 The Romans, who deemed her roles connected to female blood matters surrounding birth and menstruation as impure, had shifted her, allying her to Diana Triformus, once again shared with Proserpina (Persephone). ~ by meanderingsofthemuse on August 9, 2012.